New year, new themes I've decided. I plan on keeping my theme of Market Mondays where I will post something that I have purchased for use in my classroom and give a quick review of it. However, now that I'm also utilizing 1:1 iPads in the classroom, I decided that my theme of Website Wednesday no longer fit what I wanted to do. So.....(drum roll please) I've decided to now do Techie Thursday in place of it. These posts will feature anything that has to do with technology - websites, apps, ideas, etc... Of course I may post things that have to do with technology on other days as well but at least this will guarantee one technology post a week. Today's Techie Thursday is all about one of my all time favorite apps that I use in the classroom with my students almost daily. It's called Popplet. This app is a visual tool to allow students (and adults) to visually organize their thoughts or data. I mostly have my students use it as a graphic organizer tool to organize their writing. However, check out the multitude of ways that Popplet creators see it being used in this screen shot taken from their website. I'll admit I'm at the tip of the iceberg. There is so much more I could be doing with this tool! Let me explain a bit more. You can easily download Popplet from the iTunes store. There are two versions - the lite version which is free or the paid version which is $4.99. Obviously with the lite version there are restrictions and I have found with my time using Popplet it is WELL worth the $4.99 they are asking for. However, if you don't have an iPad or other Apple device don't let that deter you from checking this cool tool out. They also have it available online at www.popplet.com. You can create an account and begin making Popplets right away. They do have a maximum limit of 5 Popplets that can be created but now you can sign up for a Popplet plan depending on how much you plan on using it. They even offer school discounted pricing per student account. Students can create individual Popplets which only they can see and work on or they can do collaborative Popplets. 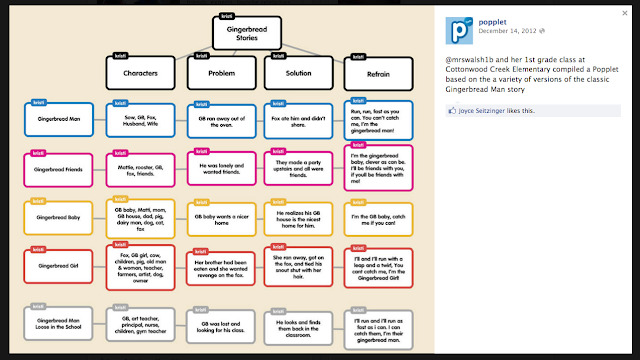 Below is an AWESOME example of one from the Popplet Facebook page that another teacher did with her students. There are a variety of features available and this particular app is extremely easy to use and begin working with immediately. You have the ability to change colors, import photos, videos, draw pictures and so on. 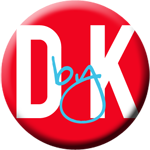 Here is a video that eduTeacher created to show the basics of getting started in Popplet. In addition to their webpage, Popplet also has a Facebook page. I highly recommend you also check that out. It's awesome to see how teachers in ALL grade levels are using this tool in their classroom. 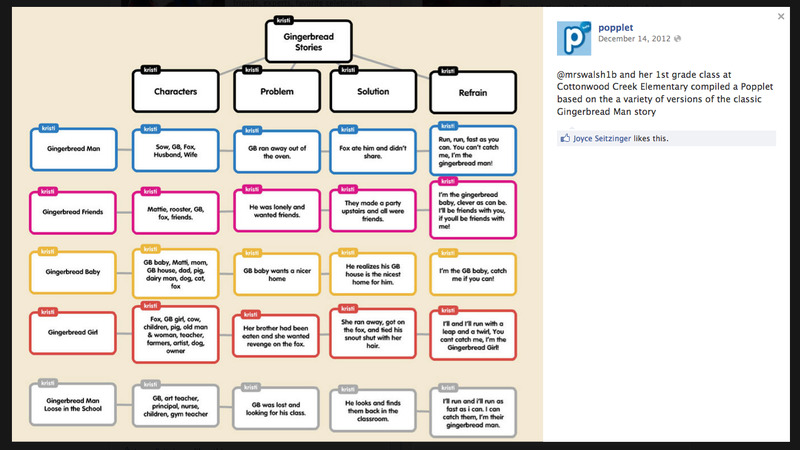 Do you use Popplet? What are some activities you've done? Share below! I just discovered this app yesterday and d/l to my teacher iPad. Can't wait to play with it. Only wish my students each had an iPad....that would be awesome! Thanks for the post...and fb mention!! !